Ski season has officially begun in Beaver Creek, one of Colorado’s premiere ski areas, and Park Hyatt Beaver Creek Resort and Spa is celebrating by announcing several new amenities and programs this winter. Located in the heart of Beaver Creek ith the mountain’s only true ski-in, ski-out access, Park Hyatt Beaver Creek’s gracious accommodations and luxury amenities are complemented by its new culinary programs, meetings incentives, family-friendly packages and programs, and unprecedented access to some of the best skiing and riding in the west. In September 2011, the Park Hyatt brand transformed its acclaimed Masters of Food & Wine event into an international series of seasonally- and locally-inspired culinary weekends at Park Hyatt properties designed to make culinary ‘masters’ of local residents and guests of the hotel. The quarterly program debuted at 19 Park Hyatt hotels around the world, including Park Hyatt Beaver Creek on September 23 and 24. Highlighting Colorado ingredients, flavors and cuisine executed by local culinary talent, the event featured New Belgium beer tasting and pairing and a family-friendly event in partnership with the Little Chefs of Vail program. The official launch of the program brand-wide and next Masters of Food & Wine event will be held January 13-15, 2012. Travelers visiting the luxurious Park Hyatt Beaver Creek Resort and Spa this ski season can take advantage of savings with the property’s signature Stay Free-Ski Free package. Guests booking either a four- or seven-night stay at the hotel will receive their last night free, plus lift tickets for two for the entire stay. Package is valid on stays totaling four nights February 27 – March 9, 2012 or seven nights March 19 – April 8, 2012. Prices start at $270 for four nights, $356 for seven nights, per person, per night. Booking codes: SFSF4 and SFSF7. With the “It’s even better when it’s on us” promotion at Park Hyatt Beaver Creek, guests can enjoy a Welcome Credit to enhance their stay. The Welcome Credit can be used for anything from drinks at the bar to spa treatments, fun time at the kid-friendly Camp Hyatt to a round of golf. Guests will receive a $100 Welcome Credit with a two-night stay, $200 for three nights, $400 for four nights or $500 for five nights. Valid through February 29, 2012. Use code WELCRE. 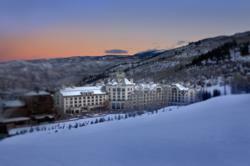 Park Hyatt Beaver Creek has officially opened its doors to furry, four-legged guests. The property is the first dog-friendly luxury hotel in the coveted Beaver Creek area, and for a one-time fee per visit of only $50, dogs less than 90 pounds are treated to special hotel amenities upon check-in including a plush dog bed, set of food and water bowls and mats. The surrounding area offers plentiful outdoor recreation options for the ultimate dog fitness program in a scenic setting including hiking trails, bike paths and dog-friendly parks. Allegría Spa at the Park Hyatt Beaver Creek has debuted several new treatments this season. The Javanese Lulur, a royal Indian body treatment originally performed to prepare Javanese princesses for their wedding day, that includes a purifying rice and jasmine scrub, a nourishing honey yogurt treatment, and a hot bath infused with jasmine and frangipani followed by cool violet compresses. A jasmine shea butter massage completes the therapy. The one hour, forty-minute treatment costs $275, not including tax and gratuity. Other new treatments include a sweet lavender scrub and massage and a High Altitude Adjustment Treatment, which uses acupuncture to stimulate oxygen-rich blood flow through the body, a vitamin B12 injection and Chinese herbal medicine. Park Hyatt Beaver Creek will offer heated towels and robes at the outdoor Jacuzzis this winter, which, with the heated patio and walkways, and kid- and parent-friendly hot toddy hut that features traditional, specialty and make-your-own hot toddies, will make après ski relaxation and lingering soaks after a long day the ultimate luxury experience. Vail area meeting resort and conference center] maintains and promotes its commitment to the environment with the “Meet and Be Green” initiative, a program in which guests who follow ten simple steps to make their meetings more sustainable and have less of an impact on the environment receive three percent off the total cost of the meeting. Some of the steps include recycling, eating locally, shipping less, providing reusable water bottles and using recycled products. “Meet and Be Green” meetings are valid through March 31, 2012. Located in the heart of Beaver Creek, at the base of one of Colorado’s most celebrated mountain resorts, Park Hyatt Beaver Creek Resort and Spa provides guests unprecented access to some of the best skiing and riding in the west. This 190-room resort offers true ski-in, ski-out access and is just steps away from the many shops, restaurants, cultural attractions and outdoor adventure activities that inspire guests to return to the property year after year. With warm, gracious accommodations, the chateau-style property includes many amenities including the 30,000 square foot Allegria Spa featuring 23 treatment rooms and complete with full-service fitness center, slopeside pool and hot tubs, three on-property dining experiences including 8100 Mountainside Bar & Grill and McCoy’s , a ski concierge and on-site ski rental shop. For more information, visit http://www.beavercreek.hyatt.com.